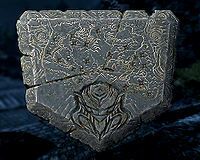 The Dragonstone is retrieved from the boss Draugr in Bleak Falls Barrow. 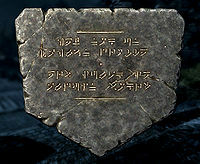 On its front is a map showing various locations with dragon burial sites, and on its back is a script in the dragon alphabet. A second version with ID 000ad06f and editor ID E3DemoMQ103Dragonstone that doesn't appear in the game was part of the E3 demo of the game. It is identical in all other aspects. This page was last modified on 29 November 2018, at 16:35.